It seems fitting that we begin our blog series by looking at some major news out of Australia. Tech wise, there wasn’t much bigger than this week’s launch, by Senator Stephen Conroy, of the Federal Government’s Digital Economy Strategy for 2020. Now to be frank, Stephen has one of those job titles which is nigh on impossible to fit onto a business card. He is the Minister for Broadband, Communications and the Digital Economy, Deputy Leader of the Government in the Senate and Minister Assisting the Prime Minister on Digital Productivity. Try sticking that in your jacket pocket. Added to that, he has the – unenviable, some would say – job of explaining the government’s vision for the NBN (National Broadband Network) along with their strategy for the nation’s digital economy. A tall order when realizing that not everyone is ‘digging the digital’ and there are squawks and squabbles from quite a few quarters as to the cost of this vision. Firstly, let’s give credit where credit is due. 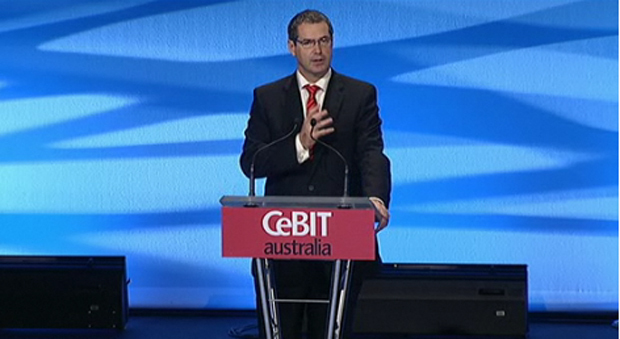 The explanatory video, launched at the Plenary Opening Session of CeBIT Australia 2011, was extremely well done. As I see it, it will do more to explain the benefits and necessities for a nationwide roll out than any number of speeches, op-eds, talking heads and white papers could accomplish. It is an interesting, informative and user friendly presentation which explains the ins and outs of the strategy to the general man or woman in the street, in their homes and in their businesses. As an impassioned advocate for eHealth and its possibilities, I was extremely happy to hear the plans. Though the current trials are minor in scope – and too my mind, could be much grander in scale – they are a start, and a step in the right direction. I left the launch feeling positive about the plans and pleased to hear of the projects both under way and on the way. The initiatives proposed could already be undertaken successfully with current infrastructure. Communicating within Australia is nice – but its a global economy out there – the bit pipes to the rest of the world seem under dimensioned (compared with Northern Europe) so why doesn’t the Government invest in connecting the country to the global digital economy rather than facilitating a small local one? As the NBN has structured engagement in the same way as the government’s tender process is structured, only large multinational organizations, particularly those from the US and Europe, will be able to become involved. As such, though there is scope for these large corporations to make a great profit from the project, it is unlikely that any Australian company – other than those that are outposts for the large multinationals – will do so. In that regard, it is difficult to see how the Australian tax payer will recoup much from their tax investment. If you look at what happened with the fibre that was laid between Europe and the US, billions of dollars were written off. So in the next decade, it is likely that a consortium will be buying up the bits and pieces that have gone bankrupt, for a song. The cost of the project is such that it should be looked at like the interstate highways projects, which is a communal asset. If seen as infrastructure the project makes sense; however, if it is looked upon as a potential for the government/tax paying public to make money it will only disappoint. Unlike Michael, I see the NBN and the digital strategy as being fundamentally important to the nation. I don’t think Australia can afford not to follow through with the plan. Once again I will refer to eHealth and the opportunity which it gives Australia as a nation to lead the world in innovation – something it currently does not come anywhere near doing. It is very clear that Australia has a proud tradition of adapting healthcare to match the geographical barriers and vast remoteness of the continent. In 1928 the Royal Flying Doctors Service commenced servicing rural, remote and regional areas of Australia utilizing the new technologies of motorized flight and radio. The struggle to deliver the highest standard of health to all Australians has long meant pushing the envelope of technological advances. The eHealth segment of the Digital Economy Strategy is the next step in that long line of innovation. It will be a great shame if, as we have seen to date (with technology announcements and strategy) the government decides to focus only on partnering with large multinationals. To do so would leave Australian innovators and business owners relegated to picking up the crumbs that are left behind. This entry was posted in Technology and tagged #au20, Digital Economy Strategy 2020, eHealth, NBN. Bookmark the permalink. I am currently working up my comments on the DE strategy, but let me just make one quizzling point. The DE strategy video showed musicians supposedly jointly performing using their broadband connection. The video compression takes about 1.5 milliseconds. That is too long to be able to co-ordinate (if you want to see that go to a conference these days – speaker is heard on analogue PA, but the digital video perceptively lags). I’m told that they tried to do this simultaneous music thing with two choirs at the NBN Co launch in Armidale, but what they did was sang verses alternatively between the two ends with a couple of extra notes thrown in to cover the delay in getting the Tassie choir to “catch up”.